I still think Sonic Free Riders for Kinect is a broken game. And I'm not alone. But it sounds like there is a whole other camp out there who haven't really had any problems with the game. So what gives? In my review of Sonic Free Riders I talked about how completely unplayable the game was for me, I even showed how completely unplayable it was. The menus didn't work (Yes, I know you swipe down at an angle, not across), Kinect lost me in mid-race. It was a mess. And I wasn't the only one with the issues. Hopping over to Metacritic I see that of the seven reviews listed (We don't use scores so we're not included), only Official Xbox Magazine and IGN gave the game a score above 70. Joystiq gave the game the lowest score, a 20, followed by GameTrailers, which gave it a 40. All of these reviews cite control issues for the low score. But some readers in my review started talking about how they didn't have any issues with the game. So I went to Totilo and asked him to try playing it, to see what his experience was like. To my surprise he said that the game's controls worked for him. He still found elements of it frustrating, but Kinect appeared to track him in-game. Baffling. Sega, too, seems baffled. So baffled that they offered to fly me to their studios to play the game with them to see what was going on. I politely declined, but suggested they poll reviewers to see if there was some commonality among those that had control issues. That's what I'm going to do here, but with those of you who have the game. Normally I wouldn't be so interested in why a game did poorly, but it sounds like this could be a bigger issue with Kinect, something that could have an impact on gamers and future games, so let's see if there is something to this. Experience: Despite time spent with the developers at Gamescom, no amount of timing or special execution made the Kinect see me at times. Experience: Understanding the timing needed for executing key moves was neither intuitive nor physically comfortable, but the Kinect tracking did seem accurate. Experience: During review Kinect didn't lose sight of me, however for the game to properly register movements it required exaggerated leaning, both forward and back, to the point of being uncomfortable. Lag time with jumps made executing tricks nearly impossible. Didn't have any problems with menu navigation. Experience: In his review on Ars Technica, Kuchera said that the game barely worked and shows issue with Kinect jumping. Experience: My issue was the leaning mechanics used for turns. It seemed that I had to exaggerate my lean far more than one would normally expect. An over-exaggerated lean only resulted in my character turning slightly. It was not uncommon for my character to hit a wall multiple times during a race. Experience: Never had a problem with Kinect not recognizing me (that's a hardware issue more than software anyway). The controls take a lot of getting used to, but I was able to control it fine and beat the entire game without major issue. Ring collection missions were the biggest pain since they required very exact movement. Distance from Kinect: 7 feet. Tried camera both above and below television and it made no difference. Experience: The result is the equivalent of patting your head while rubbing your stomach while riding a unicycle. At best it's clumsy and frustrating, at worst you'll simply end up screeching to a halt unintentionally. Experience: I know how you feel about the 'slow and steady' motion needed for choosing options on the menu. One of the biggest problem seemed to be the 'jumping', which was inconsistent at best. It seemed like the Kinect didn't pick it up quick enough, or even recognize jumping at times. 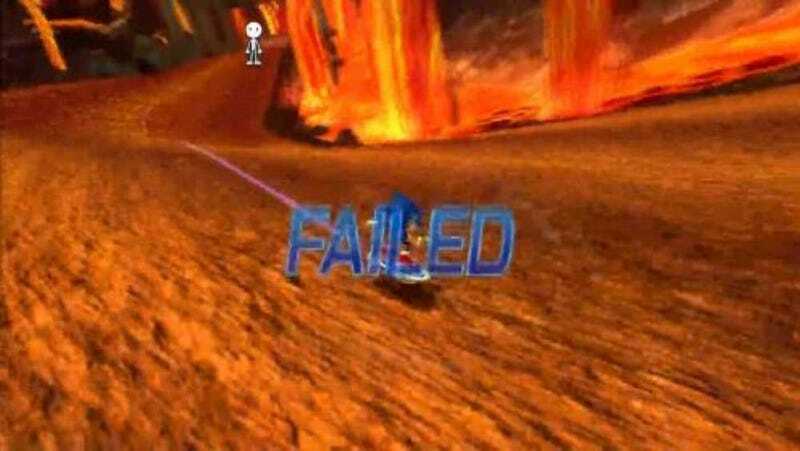 It was tough and frustrating when it came to consistent motion in Sonic Free Riders. We've contacted a half dozen or so other publications about their reviews to get their stats. If they're willing, we'll add their stats to this story as they come in. Now, if you have the game, go ahead and add your info to comments.